As Dormouse dreams--and snores--his way from winter to spring, he imagines going on fantastical adventures with his best dormouse friend. Whimsical illustrations feature other animals entertaining themselves with dart games, cross-country skiing, flying airplanes, and more while Dormouse hibernates. 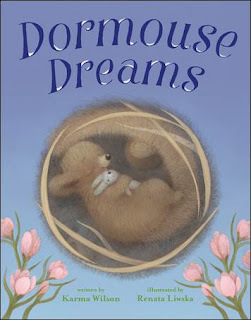 Readers can also follow the friend's journey to Dormouse's house, where she wakes him up for some real life pleasures, including daydreaming. This is the perfect bedtime book to snuggle up with when spring isn't coming fast enough. This book is the perfect little story to share with your child. It is a perfect story to discuss hibernation of animals. In this story a little snoring dormouse sleeps away winter and dreams while sleeping of spring and the arrival of his friend. The story includes illustrations of animals playing in the winter snow like a child might. It also includes if you look carefully at the illustrations, Dormouse's friend taking all kinds of modes of transportation to arrive at dormouse's house in time for spring fun. This is a sweet story with many things to talk about using the story's text and illustrations. A perfect bedtime story too.